We’d love your help. Let us know what’s wrong with this preview of Driving Home For Christmas by Emma Hannigan. Christmas at Huntersbrook House is a family tradition and this year it's even more important as, with mounting debts and insufficient income from the livery yard, it looks like the Craig family might have to sell their beloved family home. Pippa, Joey and Lainey are the three grown up Craig children who, caught up with their own lives in Dublin, are, as yet, unaware of the Christmas at Huntersbrook House is a family tradition and this year it's even more important as, with mounting debts and insufficient income from the livery yard, it looks like the Craig family might have to sell their beloved family home. Joey is starting to wonder if his controlling, fitness-mad girlfriend really is the one for him. Lainey, the family worrier, is doing her best to ignore her ex's recent engagement while also trying to look out for her sister Pippa whose frivolous lifestyle is about to catch up with her. To ask other readers questions about Driving Home For Christmas, please sign up. When I was sent driving home for Christmas, I was unsure of what to expect. I have never read a book by Emma Hannigan before and was not sure of her style of writing. This story is based around the Craig family. The chapters are relatively short and each represent one of the members from the family. The story is in the run up to Christmas, where they normally spend it at Huntersbrook House as a whole family. All the characters in the story are written very well, I had a connection with some and When I was sent driving home for Christmas, I was unsure of what to expect. I have never read a book by Emma Hannigan before and was not sure of her style of writing. All the characters in the story are written very well, I had a connection with some and found it hard to relate to others. Pippa was my favourite character and actually reminded me slightly of Becky Bloomwood from the shopaholic series. She loves to spend money and is in a lot of debt. I do not think there was meant to be a connection between the two, this is something I just interpreted from reading her character. I also loved Joey, I thought his character was written very well and loved his story. I felt sorry for him at times and then envious that he got to spend so much time at Huntersbrook House! Lainey I found hard to connect with and I didn't find her story as interesting as the others in the family, saying this though the story would have not been right without her and it was important her character was included. For me I found I had a personal connection to the book. When growing up I had a strong family unit and we would visit my grandparents in Cornwall where they had a large house. This bought back memories for me reading this book and I made links between my own family Christmas and the Craigs. I would say that this book is Christmas wrapped up in a box, it is about family, connections and the love you have for your family. I would recommend this book to everyone for Christmas as its heart warming and makes you wish you were part of the Craig family sharing their family Christmas. Who says you have to read Christmas themed books in December??? Huntersbrook Lodge, in Southern Ireland, is home to the Craig family. The kids mat have have grown up and moved out, but always come back for the traditional Huntesrbrook Christmas. A period house, on acres of land, the Craigs fill the rooms with festive decorations, light the fires and cook up a storm. Only difference this year, is that money has run out and the house may be in jeopardy. The younger generation are unaware and are ha Who says you have to read Christmas themed books in December??? Huntersbrook Lodge, in Southern Ireland, is home to the Craig family. The kids mat have have grown up and moved out, but always come back for the traditional Huntesrbrook Christmas. A period house, on acres of land, the Craigs fill the rooms with festive decorations, light the fires and cook up a storm. Only difference this year, is that money has run out and the house may be in jeopardy. The younger generation are unaware and are having their own problems. Lainey is recovering from a break up and stalking her ex on Facebook, Joey has the girlfriend from hell, but she happens to be beautiful and he is the envy of the male population, while Pippa is on a spending spree which seems to be getting out of control. Will a family gathering make things worse, or will the heart of the home bring out the best in them? I first came across Emma Hannigan's work when I read The Pink Ladies Club. I devoured it and have been a fan ever since. Her writing is so simple and endearing. There is no need for shock tactics or major plotting. The characters do the work. The Craig family were a little difficult to like at the beginning. It's hard to feel sympathetic for people who's biggest problems seemed so trivial. However, as the novel moved on, and the characters developed, the grew on me. Each of the children had their own annoying traits and I actually wanted to give them a stern talking to at several stages throughout the book. I did love the parents, Holly and Paddy, and their housekeeper, Sadie. The buzz over the Christmas period is really brought to life within these pages, but it's not necessary to read this only in winter. It is a story of family, first and foremost, and Huntersbrook is a beautiful Georgian home, with its own quirkiness and history. Well worth picking up, anytime of year! Christmas themed books are my favourite, I absolutely love Christmas and anything related to it, so books and Christmas together is wonderful. With that in mind, I was very excited for Emma Hannigan’s book Driving Home For Christmas, and I couldn’t wait to get started! As this was my first time reading Emma’s writing, I wasn’t sure what to expect, but I quickly became absorbed in her wonderful writing and story. I really liked the characters, and I found that I was interested in them as separate p Christmas themed books are my favourite, I absolutely love Christmas and anything related to it, so books and Christmas together is wonderful. With that in mind, I was very excited for Emma Hannigan’s book Driving Home For Christmas, and I couldn’t wait to get started! I really liked the characters, and I found that I was interested in them as separate people as well as a family too. I really invested my emotions and feelings into their individual story lines. I enjoyed that they all had their own dilemmas, like Joey and his girlfriend, or Lainey and the situation with her ex, because it helped them stand out from the family on their own, and I really felt by the end that I had spent time with each and every family member. I was really rooting for the characters and I thoroughly enjoyed my time with them. The descriptions were beautiful, whilst reading I could picture the scenes clearly in my mind and at one point I could almost feel the snow falling around me. Another excellent book by this author. Nice easy read to get the Christmas reading started. I had the feeling when I started reading this book that it was one in a series of stories about a family, but it appears not. I have to admit, I really didn't like it. Full of stereotypical characters and selfish, vapid women. The story dragged on with little real conflict apart from the accident and even that seemed to be glossed over. I loathed the way the nervous girl (who was demonstrating how to make a fruit cake) was written. There was no empathy for her and the same goes for the man with I had the feeling when I started reading this book that it was one in a series of stories about a family, but it appears not. I have to admit, I really didn't like it. Full of stereotypical characters and selfish, vapid women. The story dragged on with little real conflict apart from the accident and even that seemed to be glossed over. He did his best to show them how to make Christmas crackers but he was too much for Holly and Sadie who had to retreat outside. As for the comments about the jumpers knitted by the 'local elderly people' (and I wonder if Holly actually paid any of them for knitting the jumpers, or was she just trying to get cheap presents under the pretence of 'helping the local elderly people?) I found the mocking comments truly unpleasant. Do writers have to play the 'let's make fun of old people' game? Just because people are old there is no reason to portray them as incompetent, drooling idiots. The only character I had any sympathy for was Joey. A feel good book which makes you want to pick up the phone and call a relative you haven't spoken to in a while . It Highlights the importance of family and how we are all seeking that special someone. I would like to read Hannigans other books. Meet the Craig family – Pippa, Lainey and Joey – the grown-up children of Holly and Paddy Craig – the owner of Huntersbrook House. As in the story, the coming Christmas might be the last at the family house-Huntersbrook House. The three children are clueless about the future of the house and only the pa and ma are aware of how they are about the lose the house. Pippa, Lainey and Joey each leads their own life but they are bonded with the family tradition of celebrating Christmas at home with Padd Meet the Craig family – Pippa, Lainey and Joey – the grown-up children of Holly and Paddy Craig – the owner of Huntersbrook House. Pippa, Lainey and Joey each leads their own life but they are bonded with the family tradition of celebrating Christmas at home with Paddy and Holly and not forgotten their absent grandma - Maggie. Readers will only meet Maggie at the end of the story but she is also one of the main characters in the family. Whilst Maggie is said to be away Down Under with a male friend, Paddy and Holly are left to decide on the future of the house. With business not doing well, they may have to give up the house. The three children are not aware of the financial state of the family and so have no idea that the next Christmas might be the last at Hunstersbrook. As it happens, Lainey is struggling from her recent breakup, Pippa is submerged with debts and Joey, despite being successful at work is not so in the department of love as Sophia seems to hate his family and just could not understand all the hype of being together at Christmas. The plot flows to Christmas preparation at Huntersbrook with all the decoration of the Christmas trees amidst the worries of losing the house. A feel good story this is as the ending is a happy one ….Maggie returns home on eve of Christmas and the family knows the reason of her leaving the family so suddenly which is not to be with her male companion but due to her illness. She had cancer but is cured now. The family is rejoiced of her coming back but some hurtful truths are confronted. The story touches on the many sides and conflicts in a family. Mother and daughter’s bond is one of Holly and Maggie and Holly and Lainey. I guess the main message is family bonding. Which is what makes the book a nice one to read as one knows..whatever the hardship is, the family comes together , it will work out. The house shall remain in the if family as the compensation money from Joey’s unfortunate accident will be used to maintain the house – although the Paddy and Holly rejected it in the beginning. I guess in every cloud there is a silver lining and that one’s calamity can be turned into a fortune. With Maggie back at home, the family is reunited. Pippa has started her own business in the line she loves – fashion..Lainey is finding love again with a guy she met at a party. Joey is separated with Sophie and with another S – Skye. Of which everyone is the family approves. A happy ending. A nice reading for the season of joy to celebrate the love and bond of family. A beautiful family novel set during Christmas about the incredibly close-knit Craig family, centred around the family home, Huntersbrook House, in which the 3 children (Lainey, Joey and Pippa) grew up. All three kids have moved in the direction of Dublin for work now, although they remain close and return to Huntersbrook often. The book basically chronicles typical struggles of the family following the matriarch Maggie’s (the siblings’ grandmother)’s seemingly random decision to follow her man t A beautiful family novel set during Christmas about the incredibly close-knit Craig family, centred around the family home, Huntersbrook House, in which the 3 children (Lainey, Joey and Pippa) grew up. All three kids have moved in the direction of Dublin for work now, although they remain close and return to Huntersbrook often. The book basically chronicles typical struggles of the family following the matriarch Maggie’s (the siblings’ grandmother)’s seemingly random decision to follow her man to Australia, which was not in any way possible taken well by her family. The book opens with a letter to Maggie describing the things going on at Huntersbrook House in her absence, although we later find that it is an email. This confused me at first, I think the author meant for this to introduce the characters but it was in a slightly odd way that left me rather confused. The narrative then focuses on each of the characters in turn (changing in each chapter) as the children go about their lives and jobs in Dublin while their parents remain at Huntersbrook House where mother Holly is busy with her annual preparations for Christmas. There is the usual fanfare of issues with jobs, friends, money and love interests or otherwise, which are resolved when the family comes together for the festive period. Hannigan writes incredibly well, conveying emotion so effectively through her words and the subtle change in style between paragraphs made it seem like each of her characters had a unique voice which I thought was the beauty of this book. I enjoyed this very much for what it was: A warm, easy read set over the Christmas period in a truly likeable family that sticks up for one another. This is the first of a duo, the second of which I am looking forward to reading. A solid 4 star rating. The Craig family siblings are looking forward to coming together for Christmas at Huntersbrook House with their mother, father and housekeeper Sadie. It’s been a very sad year for them all since their Grandma decided to emigrate to Australia with her new boyfriend. Christmas just wouldn’t be the same without her. The whole family miss her so much, especially their mother who is an only child and truth be told it has caused a bit of a rift in an otherwise happy family. Pippa has had a horrible yea The Craig family siblings are looking forward to coming together for Christmas at Huntersbrook House with their mother, father and housekeeper Sadie. It’s been a very sad year for them all since their Grandma decided to emigrate to Australia with her new boyfriend. Christmas just wouldn’t be the same without her. The whole family miss her so much, especially their mother who is an only child and truth be told it has caused a bit of a rift in an otherwise happy family. Pippa has had a horrible year and the fright of her life, whilst poor Joey is recovering from an accident that has seen him back at his family home in two plaster casts. Lainey’s year hasn’t been brilliant either, as after her split up with Seth, she feels very low. She just cannot get used to life without him. Huntersbrook will be such a special treat for them, catching up with all the news, relaxing by the log fires, decorations so beautifully handmade and with the gorgeous scenery all around them. But life isn’t always predictable and as Christmas gets closer there are one or two shocks brewing and secrets to be spilt. I’ve met the Craig family before and it was so lovely to catch up with their lives. Emma Hannigan is a superb storyteller and in creating the Graig family, she has beautifully captured the dynamics of a close and caring family, each with their own stories to tell. I really enjoyed this novel and am very glad I reached for it in my pile of books to be read. It was easy to read I enjoyed the beginning getting to know the characters but then towards the middle it started becoming a bit to predictable and very unrealistic which is fine in some ways but I think it could of done with being a bit more representative of your average family and it felt a bit rushed to get in wrapped up in the end. Just one thing I was wondering considering how many bedrooms does this house actually have because on my estimation there must be at least 6-7! Enjoyed this book thoroughly. Set in Ireland at christmas time. Easy reading. Much better than I expected. Though I would have preferred a little more on Christmas itself as there was so much buildup and the actual festivities passed quickly! This is the best Christmas book I have read this year. I felt so completely wrapped up in the Craig's world and have come away feeling extremely festive and really looking forward to Christmas. Driving Home for Christmas focuses around all the different members of the Craig family. There's Holly and Paddy who live at Huntersbrook and then there's their children Lainey, Joey and Pippa. Each chapter focuses on a different characters' life and I loved switching between each of them and what was happening in their lives. Each year for Christmas they come back to Huntersbrook House for Christmas which Holly absolutely loves decorating for the Christmas season. They even go out and chop down their own Christmas tree! It was just so festive and traditional and it had everything about Christmas in it that I loved. Christmas doesn't feel like it will be completely the same though as Maggie, Holly's Mum has left them all and gone to Australia to live with a man called Sid. Holly can't help feeling bitter towards her Mother for doing this as she has always been there for her and she really needs her now as things are looking like she will have to sell Huntersbrook House. Joey is doing well in his job and has such a hot girlfriend which he can't believe his luck at having, but she is actually incredibly selfish and not making him feel good about himself. Lainey has come out of a relationship with a horrible man, but she is still finding it hard to get over him and Pippa is having some serious financial problems and doesn't seem to be taking responsibility for herself. So with all their worries, the Craig children are really looking forward to spending Christmas at Huntersbrook House, but will it be their last? I can cannot do this wonderful book justice on how much I loved it! It definitely had me finding every possible opportunity to go back into it and lose myself in each of the Craig's world. Emma Hanningan writes so beautifully that you can picture every tiny detail and the fact that the family were all so close to each other was really close to my heart as my family are a big one and we always make sure that we spend Christmas together and we have our own Christmas traditions. Everything about this book was so Christmassy and it was completely perfect for this time of year and I'm so glad I got the opportunity to read this. It is definitely going up there with my favourite Christmas reads of all time! Driving Home For Christmas is the first book I have read by Emma Hannigan. The cover has a lovely winter countryside setting and I was hoping that the storyline would be festive to help me get into the Christmas spirit. When it comes to Christmas there is only one place the Craig family want to be and that is at the family home of Huntersbrook House. Thing is this could be the last family Christmas in the family home due to financial problems but this is not known to Joey, Pippa and Lainey who a Driving Home For Christmas is the first book I have read by Emma Hannigan. The cover has a lovely winter countryside setting and I was hoping that the storyline would be festive to help me get into the Christmas spirit. When it comes to Christmas there is only one place the Craig family want to be and that is at the family home of Huntersbrook House. Thing is this could be the last family Christmas in the family home due to financial problems but this is not known to Joey, Pippa and Lainey who all have a lot of personal problems that they really need a break from this Christmas. When I first began reading this book I really struggled as there were a lot of characters and they all seemed to blur into one to me but luckily as the storyline progressed they all began to take their own form. Because they story is told from each of the characters points of views their personalities shines through well so we soon get to know the characters well. Pippa was the character who really shone to me, she was a live wire and quite an entertaining character who comes full circle and makes some positive changes. I loved the importance of family in this book, to all of the family members spending quality time together and looking out for each other is a big thing and it is not something that I see often enough in books or in real life for that matter. There was some lovely touches of light humour especially around the Christmas presents! There was also an unexpected twist which I love in a good book. I wouldn’t be surprised if the author brought out a sequel to this book as the foundations are already in place for another instalment and I for one would definitely be in line to grab my copy to see what happens next. This felt like a very realistic and traditional read that you would love to curl up with over these cold winter months. I became so engrossed in the storyline that when I finished and looked out the window I was quite disappointed to see the sun and not a layer of fresh white snow! The story is full of Christmas spirit, especially decorations in Huntersbrook House. Holly is mad about trimming up for Christmas (probably as much as the author – you can read about that in the acknowledgments, I thought it was very funny!). The characters are a lovely bunch of people, who make a good mixture of different personalities. Holly, the mum, loves Christmas and decorating, while Paddy, her husband is not very fond of all that fuss, but he patiently follows his wife’s instructions. Pippa is a party animal and, unlike Joey, an accountant, she’s not very good at looking after her own finances (to say the least! ), and Lainey is the quieter type, who loves motorbikes and doesn’t like shopping. The Craig family appear to be the perfect family and big gatherings at the family home, Huntersbrook House, every Christmas are a tradition that has gone on for as long as anyone can remember. However, this year has been hard for everyone. Holly’s mother has moved to Australia and with husband Paddy is facing the unbearable reality that this may be their last Christmas with the family at Huntersbrook House. Their children Joey, Pippa and Lainey are also facing huge changes in their own lives. Ma The Craig family appear to be the perfect family and big gatherings at the family home, Huntersbrook House, every Christmas are a tradition that has gone on for as long as anyone can remember. However, this year has been hard for everyone. Holly’s mother has moved to Australia and with husband Paddy is facing the unbearable reality that this may be their last Christmas with the family at Huntersbrook House. Their children Joey, Pippa and Lainey are also facing huge changes in their own lives. Maybe the Craigs are not the perfect family that everyone else seems to think that they are. This is a lovely book that absorbed me fully into the lives of the Craig family – I felt early on in the book that I had known the characters personally in a previous lives. Although this is a Christmas book and has plenty to get you into the festive mood, it is more importantly a story about the importance of friendship and family at any time of the year not just at Chrismas. It is a warm and funny read and certainly not over sentimental. How I have gone this long without discovering Emma Hannigan I do not know. The one thing I do know is that I will be reading the next book and hunting down her previous novels. To tell the truth, the fact that this story is set in/near Dublin, Ireland, was a large part of the draw for me. Who doesn't love a good Irish yarn? We meet Holly and Paddy Craig and their three adult children as they're preparing themselves for another Christmas at Huntersbrook House, their family's home for generations. However, what the kids don't realize is that it may be their last. What I loved about the characters was that they all have their own strong personalities and slowly, I came to f To tell the truth, the fact that this story is set in/near Dublin, Ireland, was a large part of the draw for me. Who doesn't love a good Irish yarn? What I loved about the characters was that they all have their own strong personalities and slowly, I came to feel like I really knew them. They virtually became good friends and I was rooting for each them as they grew and learned from their (big!) mistakes. Their story will warm your heart, boost your Christmas spirit, and give you a whole new appreciation for your own family. As far as Holiday stories go, this was one of the best I've read this year... just don't expect a quick read. It moves along at a slow but steady pace, allowing for character and plot development. Believe me, the storytelling is richer for it. Huntersbrook House is the sanctuary for the Craig family and has been in the family for generations. With Christmas fast approaching it is, as always, assumed that the family will all come together at Huntersbrook for the festivities. This year things may be different with the head of the family, Maggie abroad and the grown up children leading busy lives. With the family business in trouble will this be the last family Christmas at Huntersbrooke? As Holly prepares the house for Christmas her child Huntersbrook House is the sanctuary for the Craig family and has been in the family for generations. As Holly prepares the house for Christmas her children Pippa, Joey and Lainey do their best to get back home. This is a new author to me and I really enjoyed Emma Hannigan's writing style. I loved the distinctive voice she gave each character that portrayed their personalities so well. It was an absorbing read that made me feel part of the family and events that unfolded. A wonderful feel good read exploring family life. 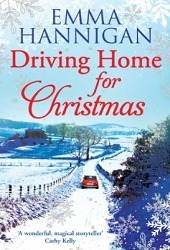 I really enjoyed reading Driving Home for Christmas by Emma Hannigan. It is the first book I have read which she has written and thoroughly enjoyed it. Christmas at Huntersbrook House have always been very traditional, lots of Christmas trees, log fires etc but this year all is different. The book follows the story of the 3 grown up children, Pippa who has been living a party existence and is now in real financial difficulties, Joey who has a gorgeous demanding girlfriend but who has no time for I really enjoyed reading Driving Home for Christmas by Emma Hannigan. It is the first book I have read which she has written and thoroughly enjoyed it. Christmas at Huntersbrook House have always been very traditional, lots of Christmas trees, log fires etc but this year all is different. The book follows the story of the 3 grown up children, Pippa who has been living a party existence and is now in real financial difficulties, Joey who has a gorgeous demanding girlfriend but who has no time for his family or really him! and Lainey whose confidence has been shattered by an ex boyfriend. They all think that returning home will solve all their problems but their grandmother upped and left to live in Australia and their parents are struggling to keep their family home, all does not go as planned. I loved curling up with this book and letting the story unfold. The characters are all likeable and the story interesting and makes you want to keep reading. A good Christmas read! Recommended to Lorna by: Catherine White, my sister. This is a lovely book I especially enjoyed cozied up in front of my fire surrounded by my Christmas tree and decorations whilst reading. Set in bustling Dublin and the beautiful Irish countryside where the much loved family home Huntersbrook House is located. Three siblings all grown and living their own lives, but still their family ties and home mean so much too each of them. Pippa is good looking and confident but is in debt and unscrupulous. Joey works hard from which he benefits but This is a lovely book I especially enjoyed cozied up in front of my fire surrounded by my Christmas tree and decorations whilst reading. Set in bustling Dublin and the beautiful Irish countryside where the much loved family home Huntersbrook House is located. Three siblings all grown and living their own lives, but still their family ties and home mean so much too each of them. Pippa is good looking and confident but is in debt and unscrupulous. Joey works hard from which he benefits but has romantic problems. Lainey is damaged from a past romance and has issues with her Mum. Add to this a runaway grandmother, a secretive Mother, a mugging, an accident, and the possible sale of Huntersbrook. I was looking for my first ever winter theme book to read and I found Driving Home for Christmas by Emma Hannigan on iBooks for free. Unfortunately, it was not what I was looking for. It is centered around Christmas, but the characters appear very weak and they are full of stereotypical personalities. I was annoyed with Holly, Maggie, Joey, Pippa, Paddy... The only character I found likeable was Liney, although she had weaknesses in some points of the read too. In addition, it took me half of th I was looking for my first ever winter theme book to read and I found Driving Home for Christmas by Emma Hannigan on iBooks for free. Unfortunately, it was not what I was looking for. It is centered around Christmas, but the characters appear very weak and they are full of stereotypical personalities. I was annoyed with Holly, Maggie, Joey, Pippa, Paddy... The only character I found likeable was Liney, although she had weaknesses in some points of the read too. In addition, it took me half of the book to realise who was who and stop confusing the characters. I think the book had a very good potential, especially if there was more drama around the house rather than the characters' inabilities to sort their lives out. Driving Home for Christmas is a heartwarming story about the Craig family based in the countryside of Ireland. The good old fashioned theme of returning to your maiden home and spending the holiday with love ones blends beautifully with the various background stories of the three grown up children, Lainey, Joey and Pippa. Kudos to the fanciful descriptions of Huntersbrook Christmassy decorations. How I would love having three trees at home! Chopping down your own tree and doing a homemade mistle Driving Home for Christmas is a heartwarming story about the Craig family based in the countryside of Ireland. The good old fashioned theme of returning to your maiden home and spending the holiday with love ones blends beautifully with the various background stories of the three grown up children, Lainey, Joey and Pippa. Kudos to the fanciful descriptions of Huntersbrook Christmassy decorations. How I would love having three trees at home! Chopping down your own tree and doing a homemade mistletoe sounds divine. I like the little surprise about Maggie towards the end. Christmas is my absolute favourite holiday since I was little so reading this book is a real treat for me. Emma Hannigan was an Irish author and blogger, best known for writing about her experience of suffering from cancer. With a family history of breast and ovarian cancer, Hannigan's mother and maternal aunt tested positive for the responsible gene, BRCA1. She also received a 'positive' result in August 2005, which carries an 85% risk of developing breast cancer and a 50% risk of ovarian cancer. In 2 Emma Hannigan was an Irish author and blogger, best known for writing about her experience of suffering from cancer. With a family history of breast and ovarian cancer, Hannigan's mother and maternal aunt tested positive for the responsible gene, BRCA1. She also received a 'positive' result in August 2005, which carries an 85% risk of developing breast cancer and a 50% risk of ovarian cancer. In 2006, Hannigan underwent a bi-lateral mastectomy (or both breasts removed) and a bi-lateral oopherectomy (or both ovaries removed) to reduce the risk of cancer developing to 5%. However, breast cancer soon developed, "in the neck, shoulder and under my arm", in 2007. After repeated treatment, a tumor always reappeared. She died at age 45 after her tenth battle with cancer.